Andreas Karelas is the founder and Executive Director of RE-volv, a nonprofit solar energy finance platform based in San Francisco. Andreas is a dedicated renewable energy advocate with over ten years of environmental and renewable energy nonprofit experience. As the effects of climate change continue to unfold in front of us; as scientists continue to report the gravity of the situation; and as our political system continues to deny reality, it can be easy to lose hope and lose sight of the progress we’re making. Thankfully neighborhoods, communities, cities, and states are driving solutions from the ground up and building momentum with real, scalable solutions. The solutions are distributed, decentralized, and democratized. They’re appropriate for that geographical and cultural context. They’re people-powered and they’re working. these projects are too small (i.e. not profitable enough) to justify the effort to overcome the aforementioned challenges for most solar financiers. 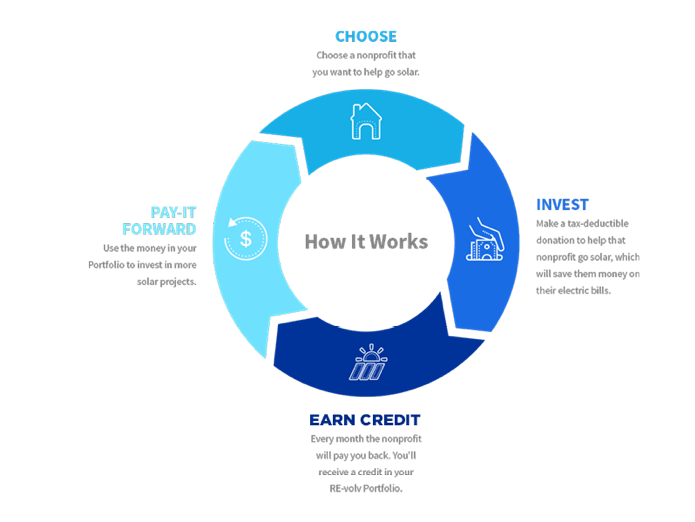 In the future, as banks become more comfortable with the solar asset class, nonprofits, and others currently left out of the solar market will be able to go to their bank and get a loan for solar the same way they would for a car or a home improvement. This will greatly speed up the adoption of solar in the U.S. In the meantime, RE-volv can help these deserving nonprofits go solar using a community-funded revolving fund finance model. RE-volv volunteers fall into two categories: Solar Ambassadors and Solar Champions. Solar Ambassadors: Undergraduate college students who participate in a yearlong fellowship and training program during which they crowdfund a solar project for a nonprofit in their community. This year we have 95 students from 11 universities across the country participating in the program. Solar Champions: Anyone who wants to volunteer to help crowdfund a solar project for a nonprofit in their community. This volunteer opportunity has less formal training than the Solar Ambassador fellowship and is more of a DIY approach geared towards adults. In East Oakland, Rev. Curtis Robinson is the pastor of Faith Baptist Church, in a neighborhood riddled by poverty, violence, homelessness, and substance abuse. When we first met, he showed me a bullet hole in his bookcase. During his first days on the job, he heard gun shots ring out and ducked under his desk. Students at the middle school across the street were shooting at each other. A stray bullet blazed through the pastor’s window and lodged itself in the wall behind his bookcase. That’s the daily reality of the community that he’s trying to serve. The church is one of the few bastions of support in the community. For example, the church’s food distribution program on Sundays gives out over 100 tons of food every year to those that may otherwise go hungry. Saving money on electricity costs translates into direct additional benefits that the church can offer to its community members. But that’s not the only reason the pastor wanted to go solar. Recently, Pastor Curtis joined with a number of other leaders of African American churches in the East Bay to protest the proposal to start shipping coal through the port of Oakland. 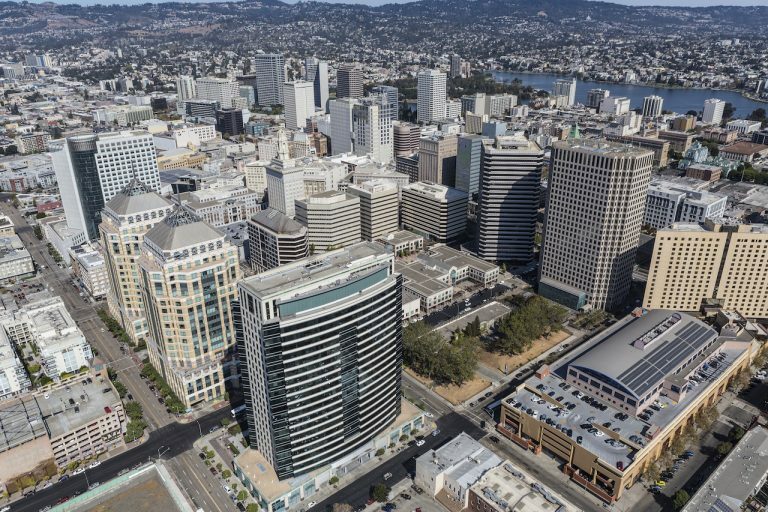 Oakland already has disproportionately high air pollution and asthma rates. Transporting coal through the community would dramatically worsen the situation. 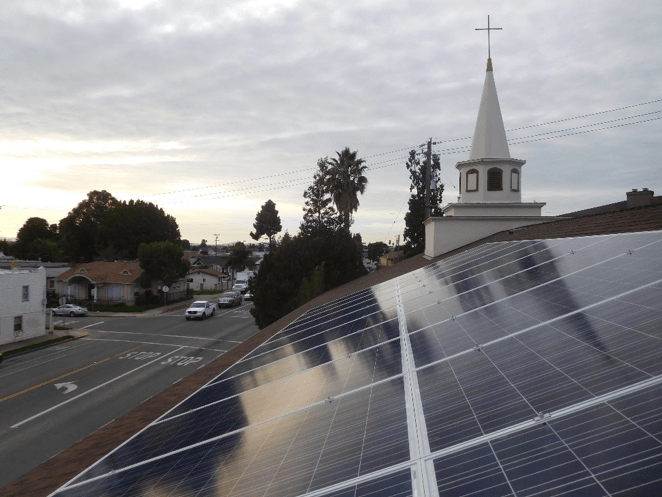 Pastor Curtis feels that solarizing Faith Baptist Church is not only a way to save money, but also demonstrate the church’s commitment to transition away from the dirty energy economy. Going solar also highlights career opportunities for people of the community. Solar, he believes, presents pathways out of poverty through the green economy. Groups like Green for All, GRID Alternatives, Solar Richmond, and Rising Sun Energy Center have been pioneers in training people looking for employment to install solar, perform energy audits, and implement energy efficiency retrofits. The more people see solar panels in their community, the less far-fetched an idea it may seem to look for career opportunities in the field. 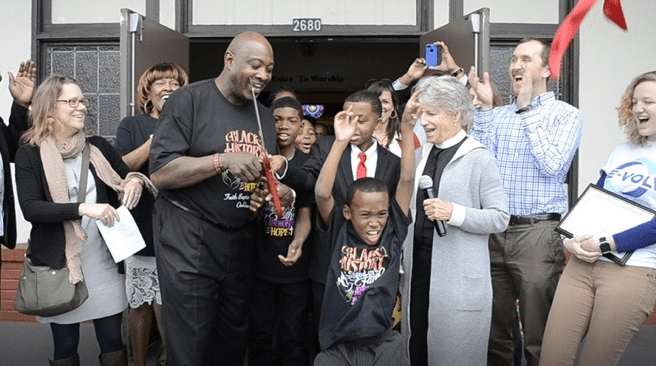 Pastor Curtis cuts the ribbon for Faith Baptist Church’s solar array. Across the country, in Little River, South Carolina, a group of foreign combat veterans support each other at their local VFW Post 10804. This group of veterans, predominantly conservative senior citizens, provides incredible services for their fellow veterans. They assist VFW members that are unemployed, have physical and mental health challenges, or are otherwise in need of a helping hand. They provide meals, clothes, even financial support for their fellow veterans. 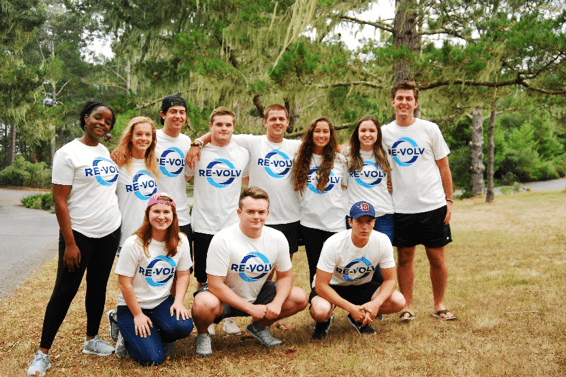 When a group of RE-volv Solar Ambassador college fellows from Coastal Carolina University approached them about going solar, they were all ears. After some thorough investigation and analysis, the VFW leadership put the proposal to a vote among the membership. They were all in. Not only was this going to save them money on their electric bills, but by partnering with the university, it would raise their visibility in the community, especially with younger audiences. While their membership is strong with older veterans, more recent returning veterans aren’t as interested in the VFW. Solar energy could help change the image of the VFW to attract younger members by appealing to the more tech-savvy and environmentally conscious. This solar array would make Post 10804 the first VFW to go solar in the state. Being that it’s a primarily conservative group, when the Solar Ambassadors were pitching the VFW members on solar, they stuck to talking points about cost savings and energy independence. As climate change can be so politically divisive, our fellows thought it was best not to bring it up. But much to their surprise the VFW members pointed out that one of their main drivers for going solar was to combat climate change. The students were thrilled to find out that this group of conservative veterans in South Carolina were looking for ways that they could take actions to curb their carbon emissions and set an example for the community. 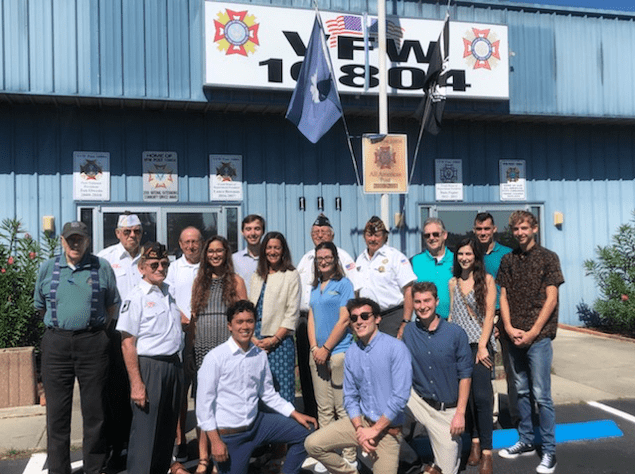 VFW Members and Coastal Carolina University Solar Ambassadors at the Ribbon Cutting ceremony. 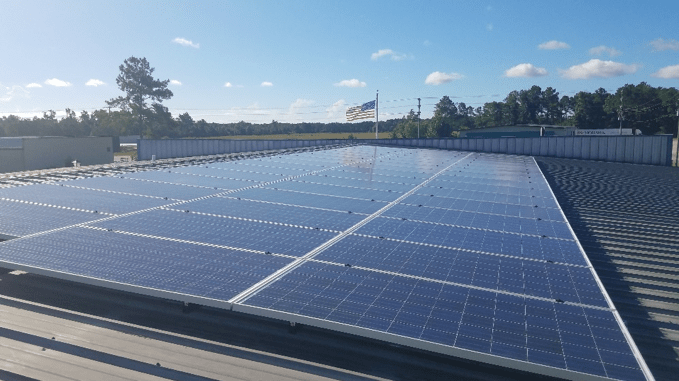 The 15kW solar array on top of VFW Post 10804, Little River, South Carolina. As Stanford professor Mark Jacobson has demonstrated, moving to 100% renewable energy is not a matter of technological or even economic obstacles. We have the technology and financing to make it happen and soon. The challenge comes from the associated social, political, and cultural friction. That’s where neighborhoods and communities come into play. When community members are empowered to bring solar to nonprofits they care about it creates a ripple effect in the culture. When schools, houses of worship, and community centers demonstrate to their communities that going solar is saving them money, is good for the environment, and most importantly is in line with their values, that creates a new perception of solar at the local level. The good news is when it comes to solar energy, numerous studies have shown that solar is contagious. There’s a measurable viral effect of solar energy. When someone in a neighborhood goes solar, their neighbor is more likely to go solar, and each neighbor more likely after that. The pace picks up momentum with each new solar system. And as more people go solar and support solar policies at the local level, that creates momentum for county, city, and state policies that can have a massive impact on solar adoption. The truth is that solar energy is by far the cheapest, most readily available source of electricity we have. As the market grows, and the technology is more widely adopted, the costs will continue to come down which will disrupt energy markets around the world. Given the short time-frame we have to stop climate change, we have to speed up that process as fast as we can, starting in our communities.